This is an off-topic post, but the incident was unique enough for me to blog about. 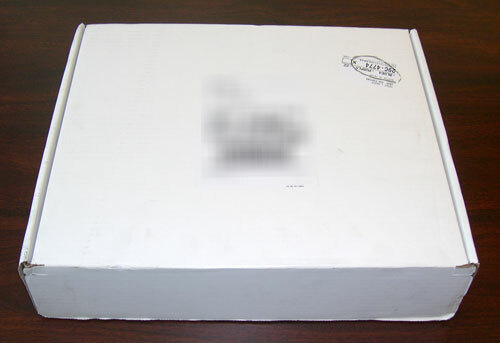 We received a package today from American Express. It was a large white box with no information on it at all. Inside the box was a black case a little smaller than a briefcase, but weighing about 10 lbs. On the case it stated ‘YOUR BUSINESS CENTURION CARD HAS ARRIVED’. 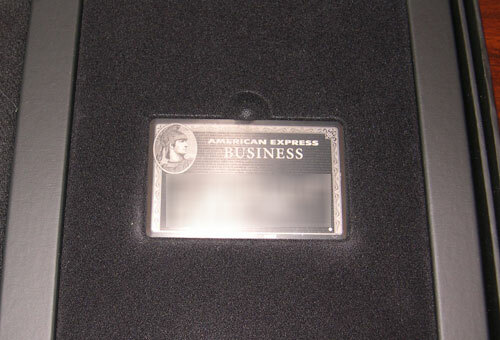 The interesting thing about the Amex black card itself is that it is metal and not plastic. The entire card including the numbers is cast or milled from a sheet of metal. It weighs about double a normal credit card. I don’t think any information is going to get rubbed off any time soon. The elaborate packaging for such a small object sets a new standard in my book. I think everyone in the office came to look at how much material was used to package a single credit card. It takes a rare product to justify the cost of packaging like this. 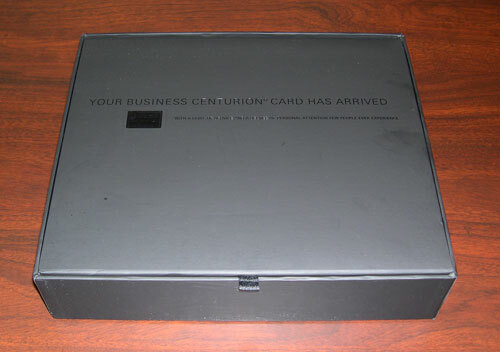 If you don’t know about the American Express Centurion Card, I found a good article on Wikipedia: the black Amex card. Hi, manny thanks to the writer of the Artikle. 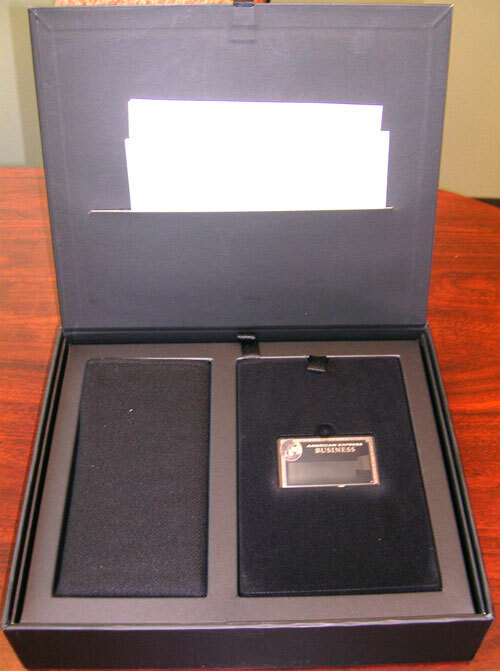 I have never seen before the black business card from amex, and as a collector, I am highly interested in to became one for my collection. If you are the owner of the card, please write me an email if you are willing to offer the expired card to me. I will pay good for the card, but lets talk about the details by email. I,m a collector of American Express cards and I can pay an extreem price for this card. Titanium ro plastic. That is a very beautiful card. It’s not surprising that they go so far with the packaging, considering the requirements. But really, if they have a black Visa, then that will be sweet. In Finland you can actually get a black Visa. I’ve got it and it’s really cool. It is “black metal” by it’s color, at first glance it looks totally black, but closer inspection reveals silvery dust too (like some car paints). Nelson, get your lies straight before you decide to waste others time. We get chosen for the card based on our assets, actual spending, and a few other qualifications. I highly doubt you have one because the initial fee along with the annual fee shouldn’t be of much concern when you have one. People, people…they aren’t that special and you don’t need to be super rich to have a Centurion card. If you own a small business and can channel your expenses through it then it is straightforward enough. Equally easy is if you travel frequently on business and can put expenses on your own card, add in your own personal spend and even the $250k threshold in the US isn’t beyond reach. It is amazing what Amex have done by saying nothing about this product. Christopher….Lies? Send me your e-mail address and I will send you a photo of my Black Card with my name on it. Don’t be a hater. The card is absurd….my Platinum Amex has the same benefits for $495 a year……frickin idiot. I have actually seen one before. Belonged to a guy that owns a beer distribution company. Even my friend who is an NBA player does not have one. I have a a black card. i got it last year when i was 20. You can ask AMEX to review your accoun to see if you qualify but more than likely it won’t happen. I have nevr heard of anyone asking AMEX for one & then gettting it, the only people i know who have one AMEX gave them the card. Everybody’s case is different. Some people have no money in the bank but spend A LOT, others don’t spend much but have a lot of assets….case by case. To be honest, for the supposed status symbol of the card, and fees paid to obtain the card, that packaging…looks kinda cheap. I’d think Amex could do better seeing as they likely made their money back on the packaging, say, a few thousand fold. I have wanted one for awhile sometimes spend over 50,000 a month on my platium renovating buildings (materials etc)…once bought 200 fridges for 159,000 on Amex. Regardless how much you are worth, spending 5,000 and 2,500 each year just doesn’t make sense…. I get to where I am by making my money work for me…not by burning it. I guess you have to be self made to understand this, but it is a mindset. I don’t feel giving away money for similiar benefits as the Platinium card makes any sense at all….from what I hear it is run by the same company that manages all the other concierge services.